German Fresnel collector manufacturer Industrial Solar has completed its second industrial solar heat installation in Jordan. Three years after it had put into operation a Fresnel field at pharmaceuticals company Ram Pharma, a 700 kW concentrating collector system came online at tobacco manufacturer Japan Tobacco International, also known as JTI, in late 2017. The solar steam that the new system produces is used in two ways. It is injected into the steam grid to supply process heat to manufacturing and it powers a new installed double-effect absorption chiller to provide on-site buildings with air conditioning. JTI regards the solar steam unit as a strategic investment to demonstrate its commitment to establishing sustainable supply chains and, especially, to reducing the carbon footprint of its global operations. Representatives for Industrial Solar and JTI had their first conversation in 2013, but it took three years before a purchase agreement was signed in April 2016. 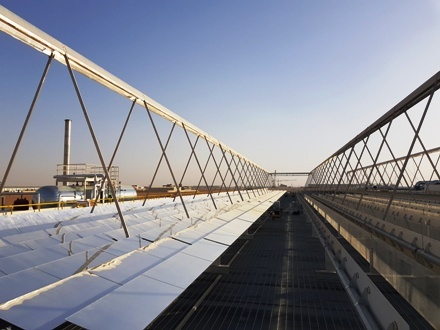 “JTI made a corporate-wide decision to invest in solar heat at its factory in Jordan. That’s why several meetings were necessary to increase understanding of Fresnel collector performance and the risks inherent in this kind of investment,” explained Martin Haagen, Industrial Solar’s Business Development Manager – MENA Region. “We’ve forged a very strong partnership and it was important that everyone involved felt that they could achieve a sense of pride and ownership in their work.” Once the contract was signed, it took little time to construct a system to provide SHIP, or solar heat for industrial processes, as no approval process was required for the installation. Simulations show that the Fresnel collector field will produce a yearly amount of 1,350 MWh of useable heat at up to 220 °C, which corresponds to a specific yield of 1,076 kWh/m². These high gains are a product of very favourable surroundings. The site is located 900 metres above sea level in a dry and sunny region, where the direct normal irradiation (DNI) is around 2,500 kWh/m². The collector field has enough capacity – 700 kW or 1,254 m² – to meet the factory’s average heat requirements. Space was not an issue when the system was installed at JTI. Since the JTI site in Jordan manufactures several products in batches, the steam drum was sized to allow for the storage of around one hour of solar energy at full capacity. The 15 m³ drum also has three other functions. It removes water from the steam, maintains the solar field pressure and acts as a water container when steam condenses inside the absorber after sunset.